We’re happy to have a growing, passionate, engaged community of enthusiastic Irish language learners. That’s why we’re always in contact with them, developing products and tools to match their enthusiasm of learning the Irish language. This can’t be done without periodically asking members of our community about their connection to the Irish language. It helps us understand our members, fans and people from all over the World interested in Ireland’s culture, history and language. That’s why we want to ask you – the Irish learning community a few questions. 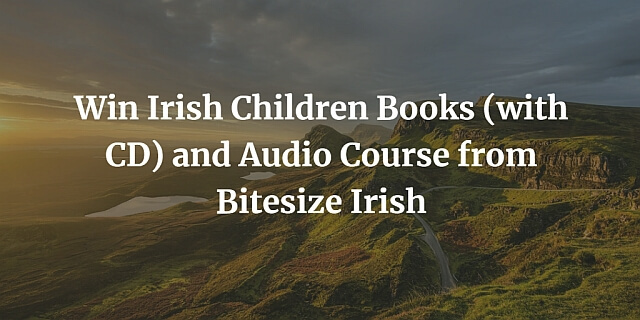 We will make it worth your time because we’ll offer you the chance to win really cool Irish children books & audio CD and one of our most requested products – the “Learn Irish with Eoin” audio course for beginners. Please fill out the following survey and you’ll have a chance to win one of the 3 copies of the Peigín Leitir Móir Leabhar agus CD-Eagrán Nua or one of the 3 copies of our “Learn Irish with Eoin” audio course. About the Irish children books (with CD): Teaching your kids to learn the Irish language will be a pleasure with this luxury hard-backed 10-year anniversary edition of this Irish-language classic collection of traditional rhymes, songs and word games. Beautiful illustrations from the Oscar-nominated illustrators and animators, Cartoon Saloon. 20 traditional songs and rhymes in Irish for children (and former children) – with music CD, featuring three generations of Ireland’s finest singers, rhymers and musicians! To get your hands on this beautiful collection of rhymes, songs and word games or our audio course, just click the following link and fill out the survey. The winners will be picked randomly from valid submissions of the survey. You can add your replies by next Tuesday (20th of November). We will announce the winners on our blog and Facebook page, and we’ll contact them by email to send the prizes. Privacy is extremely important with us so we can guarantee that the survey answers won’t be shared with any third parties and it will be used just for the development of Bitesize Irish and our community. We know for sure that the Irish Children books and our Audio course will definitely help you learn the Irish language or encourage your kids to learn it. At the same time you’ll help us to better understand the community and how to develop Irish language solutions to help you on the learning journey. Visitor questions: What do I get, and how much does it cost?